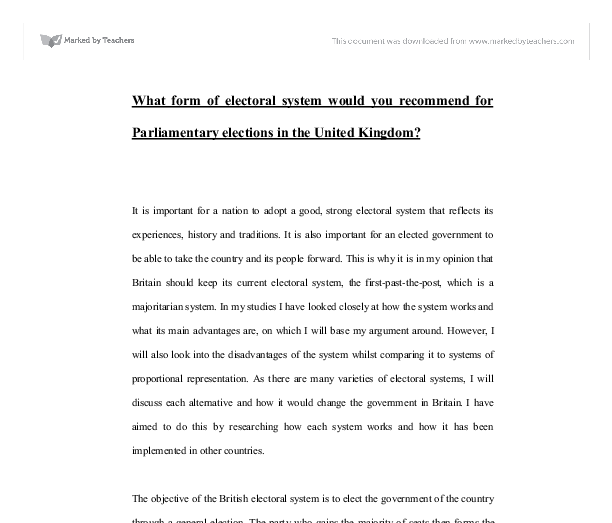 What form of electoral system would you recommend for Parliamentary elections in the United Kingdom? What form of electoral system would you recommend for Parliamentary elections in the United Kingdom? It is important for a nation to adopt a good, strong electoral system that reflects its experiences, history and traditions. It is also important for an elected government to be able to take the country and its people forward. This is why it is in my opinion that Britain should keep its current electoral system, the first-past-the-post, which is a majoritarian system. In my studies I have looked closely at how the system works and what its main advantages are, on which I will base my argument around. However, I will also look into the disadvantages of the system whilst comparing it to systems of proportional representation. As there are many varieties of electoral systems, I will discuss each alternative and how it would change the government in Britain. I have aimed to do this by researching how each system works and how it has been implemented in other countries. The objective of the British electoral system is to elect the government of the country through a general election. The party who gains the majority of seats then forms the government, even if the winning party gains only 37.1% of the votes cast, as Labour did in February 1974. This is due to the way the first-past-the-post (FPTP) system works. ...read more. In contrast, The Labour party obtained 27.6% of the total votes cast yet still managed to win a massive 209 seats. Under a PR system the Labour Party would have received 172 seats whilst the Alliance would have won 160 seats which, amazingly, is an increase of 137 seats. "The system is clearly unfair. It discriminates against small parties and does not give equal value to all votes"3 One of the arguments against a reform in the British electoral system was that FPTP allowed for a strong relationship between an MP and their constituents, however, those who are in favour of reform argue that there is no strong evidence to show that such relationships always exist. The argument is that, those who didn't vote for the MP are not really represented. For example, in 1990, Mrs. Thatcher was the MP for Finchley and the question can be asked if Labour supporters were comfortable taking their complaints to her. Also, there is no law that states an MP needs to be a resident in their constituency which means that if this was the case, it is unlikely that the MP had any previous interest or knowledge in the area. Even with all this put into consideration, there is nothing to say that by having 2 local MP's, that the relationships between them and their constituents will be any less. ...read more. After studying the processes of alternative voting systems and seeing what advantages and disadvantages they may bring by looking at how they have worked in other countries, I still believe FPTP is the most suitable for Britain. I feel that it is important for Britain to stay away from coalition governments as this undermines the electorate and could often result in disastrous problems for the government and the parties involved. This is why I support Britain's FPTP system because apart from reducing the chances of a coalition government, it also reduces the power of any extreme parties such as the British National Party. The single most important argument for the FPTP system was that it produces a strong and stable government which over the past has been one of the key reasons for Britain's development. There were disadvantages in our electoral system which I feel can be improved by improving the methods of registration and concentrating on constituency boundaries as it has been stated that electoral registers have only been, approximately, 85% accurate. A reform to our voting system would most likely happen if a third party, the Liberal Democrats, can gain more support, increasing the likeliness of a hung parliament. This would cause a coalition government which gives more ground for a reform. However, it looks like Britain's FPTP system is likely to stay. 1 'Voting Behaviour and Electoral Systems' Chris Robinson 2 The Guardian, 25 February 1998 3 'Success In Politics' Neil McNaughton 4 'Parliamentary Affairs' Helena Catt 5 Dunleavy & Weir 1997 ...read more. contact management which will help the Perfect Pie Company, save time, improve sales and marketing, and deliver better customer service. The perfect Pie Company will be able to organize and manage all their contact, prospect, and customer information in one place. The Central Upland Range divides northern Germany from the South. The Central Rhine valley and the Hessian depressions serve as the natural north-south traffic arteries. The Central Uplands include the Rhenish Schist Massif( Hunsruck, Eifel, Taunus, Westerwald, Bergisches Land and Sauerland), the Hessian Mountains, and the Weser and Leine Mountains in western and central Germany. This said, it has been found that most people only carry out two political actions per year (voting) so I doubt the validity of this argument. Currently in order to claim a government the two major parties will be chosen between within a minority of `marginal' constituencies where the result is unpredictable. Database System (Microsoft Access) - Microsoft Access is a powerful relational database management system with specialist features. The many features in this package include the creation of tables, forms and reports to any appropriate style, reflecting the business image. Access is readily available, cheap supported and well documented. Relationships can be created between tables. single field only - a compound primary key is one which combines more than one field to make a unique value Foreign keys: a foreign key is used to link tables together. It is a field in one table that is linked to a primary key in another table. The problems of the data being entered are that, they have to complete a new form and this can be tedious, thus leading to more errors. Also, this paper-based method is very time consuming and become very boring, therefore making the employees demoralised in their duties.